How Much Air Space Between Brick Veneer and Sheathing? For centuries, brick has been a popular building material. Not only is it energy-efficient, low-maintenance and aesthetically pleasing, but it also positively affects a property's resale value. Keep your brick exterior looking good by cleaning it when necessary, taking the least aggressive approaches first. Clean exterior brick walls as needed to properly maintain your home. For centuries, brick has been a popular building material. Not only is it energy-efficient, low-maintenance and aesthetically pleasing, but it also positively affects a property's resale value. Keep your brick exterior looking good by cleaning it when necessary, taking the least aggressive approaches first. Spray loose dirt off your brick exterior with a garden hose and a connected spray nozzle. Check shady areas of your brick exterior for areas with mold and mildew. Clean these areas by applying a bleach solution (1 cup bleach mixed in 1 gallon water) with a natural or synthetic scrub brush. Be sure to saturate the brick with water first so that the brick does not soak in the bleach, which can cause discoloration. 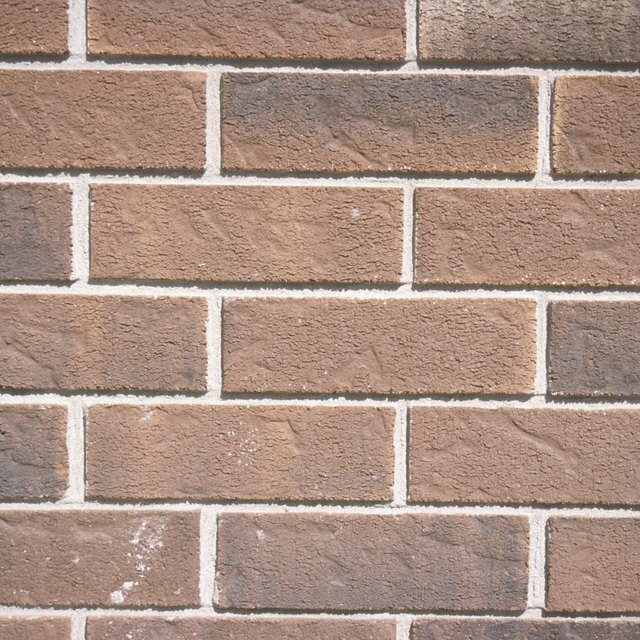 Choose a cleaning solution made for the type of brick used on your exterior. Protect nearby plants, windows and doors with tarps, if necessary. Saturate the area of brick to be cleaned using a garden hose and a connected spray nozzle, spraying from the top down. This helps ensure that the brick will absorb the water instead of the cleaning solution, which could result in staining. By spraying from the top down, you are more likely to keep the area immediately below the area being cleaned wet as well (and less likely to absorb solution that has trickled down). Apply your chosen cleaning solution to the brick according to the manufacturer's instructions. Rinse the brick thoroughly after cleaning it with lots of water, spraying from the top down. Don't leave any solution on the brick -- it can stain. Then remove the tarps from the plants, windows and doors, and allow the brick to dry. Can Wood Ashes Be Put Around Fruit Trees? Does Bleach Kill Fire Ants?